happy memorial day, all you US folks. i spent the holiday in a fashion highly atypical for me--mostly relaxed. and doing some personal shopping. i decided it was time to replace some glassware after i broke a piece last week (my first of the 15+ i am now missing). i have very bad luck with my glasses and other people. in the last 7 years i have lost many, many pieces by the hands of my various roommates. see that one lone black stemmed wine glass? that is the last of a set of 6. i also used to have four martini glasses and four margarita glasses, but my landlord (or maybe the property manager) stole them from my last apartment when i was moving*. i made do with what i had for a couple years, but when i could no longer serve wine to myself and a guest, something had to change. i did splurge a bit getting the martini glasses, but the four of them and the six wine glasses all together cost less than $20. go World Market! yay Ikea! i also started a new project despite May being the month of finishing. i started a scarf from my stash because i wanted something purely mindless to knit while relaxing on memorial day. it is hard to pay attention to sweater armhole decreases and a guest at the same time. it is the "Men's" Rustic Scarf from Last-Minute Knitted Gifts. either joelle hoverson is obsessed with naming things especially for men, or the publisher was afraid people without brains would not notice the man-oriented items in the book. odd. i am knitting it from stash yarn, and i have no definite plans for the finished project yet. maybe i am starting my holiday knitting without knowing it! i love the color green, and it is showing up in my knitting a lot. for a long time i knit almost exclusively in back and grey for myself, but green is my favourite "real" color for knitting now. today i have a finished greenie and a work in progress that is coming along nicely. knit in Karabella Cashmere Elite (4+ balls #13340 Olive, 100% cashmere) received as a gift, on size US 6 birch needles. my boss at the knit shop gave me 5 balls of this cashmere for christmas. i love the color. she did a great job picking out what would be "me" as well as surprising me with something i would not buy for myself (cashmere is a little rich for an artist's budget, even with my discount). i used every little bit between a pair of super-cute baby bootees and the rest going into this scarf. i used a slightly modified version of Hoverson's pattern to knit my scarf. i cast on 45 stitches to accommodate the DK weight yarn (the pattern calls for a chunky yarn and only 21 stitches), and i guess i made one last modification.... um... i am not a man, and this scarf is for me. so, let's just ignore that title. i have declared May the month of finishing, and i have made remarkable progress on my Gathered Pullover. after pulling out the first 6+ inches of the body back in February, i was slow to regain ground, but a few trips on the metro and i made it up to the cables this weekend. i manged to work through the entire cable chart and the first side front section. i am getting very close to a finished sweater! i am exceedingly pleased with myself for knitting the sleeves first. unfortunately, i think this is going to fit my shape poorly. hm. but i am going to finish it and figure out how to fix it if it comes to such drastic measures. keep your fingers crossed for me. my FBiL* is obviously concerned about my long term career prospects. he commented yesterday that i am jeopardizing my vegetarian food blogger career by not taking photos of my delicious breakfasts. i am pretty sure i am not going to switch from one low paying, high commitment job to another.... especially when my pictorial skills (and cooking skills!) are not near my two current favs.... 101 cookbooks and bittersweet. but i will share a few pictures because i actually cooked (for real!) last night. above we have a mixed greens salad with avocado, blackberries, and blue cheese dressing. to the right we have my "mac and cheese". it is composed of organic whole wheat penne pasta, tomatoes, and a cheese sauce composed of four cheeses and vegetable broth. the whole mixture is topped off with italian style breadcrumbs and a sprinkling of oregano. i have several finished objects that i completed while i was not knit blogging. i squeezed in time to knit, but getting the pictures taken and projects detailed was a little above and beyond. knit in Karabella "Cashmere Elite" (#13340 Olive, 100% cashmere) purchased at K+S=B on size US 4 bamboo DPNs. 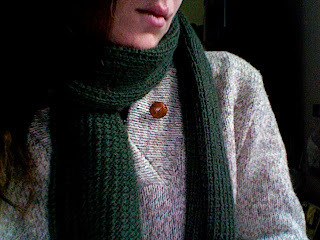 i was given 5 balls of this cashmere, and i am not a fan of very long scarves, so i used 2/3rds of a ball to knit these. super cute! i knit them before i knew of any babies on the way. now they may have little feet to adorn very soon! knit in Schulana "Merino Cotton 90" (2 skeins lime, 1 skein electric blue, 53% cotton, 47% wool) on size US 8 needles. i finished this as a store model. someone else started it in March of 2007 and let it sit after knitting 80% of the back piece. i picked it up out of the back room and finished it up in a few afternoons at work. love knitting with this yarn! knit and crocheted in Debbie Bliss "Alpaca Silk" (3 skeins gold, 80% Baby Alpaca 20% Silk) on size US 7 needles and size US I crochet hook. i whipped up this little number for my mum's birthday. i was in tech at the time for a show with a near 3 hour run time, and i needed something i could knit in the dark. it turned out very well, and she loved it because it is knit in one of her favourite types of yarn--alpaca! good color for my mum too. knit in Dream in Color "Classy" (1/2 skein "Spring Tickle" 100% superwash merino) on size US 4 & 5 DPNs. this is my second pair of mittens from this pattern. this time i used seed stitch instead of stockinette for the non-cabled portions of the mitten. i love love love knitting with this yarn. colors are fab! i made a delicious breakfast this morning. everyone should try it.... well, everyone who likes hot cereals and berries. Warm and Nutty Cinnamon Quinoa. because i am an overeager little breakfast eater! i currently have an obscene number of UFOs. un. finished. objects. most of them are playing for the 50% team. boo on that. i have decided that i need to take a few down before i 1. do any more lizard ridge squares. 2. start the other parts of my cousins' baby gifts or 3. start carving out serious shawl time. i like knitting the shawl, and it has a (distant) deadline, but some of these old friends need to come off the books. i worked on the Gathered Pullover in front of a movie the other night. each round is 152 boring stitches right now and i have not quiet caught up to where i had to tear it all out and start over. reknitting stocking stitch in the round is not as fun as i wish it was. this will get better once i pass the "tear out" mark and even better once i can work the cable motif. when i got too bored with the sweater, i finished the movie up by knitting on my cashmere scarf. it is also boring, but i wanted something simple to show off the cashmere. so, yeah. dull. dull. dull. BUT! inspired by how quickly it was coming together, i managed to knit through the 3rd of 4 balls of yarn tonight. it was helped by the fact that i switched from metal to birch needles... the metal was almost too slick for my cashmere, and the birch sped me up a bit. i joined in some cashmere left over from a 5th ball i knit into a tiny project instead of breaking into the 4th intact ball. in is probably only about 30 yards. if i had waited to use my partial at the end, i could see myself deciding to bind off after ball 4 and never use the partial. discipline! let no cashmere go unknit. this scarf is on my hit list. as well as the 2nd cabled mitten. (i LOVE the mittens. they are fun to knit and the yarn rocks--Dream in Color "Classy") i will feel much less shame about the pullover or sock once these other two re done. i will also stop feeling like the only color i knit with is green. just a quick little update. i finished the the 6th panel on the lizard ridge. i laid the 5 that were not drying from being blocked across my floor last night and decided that i may need the blanket to be 6 panels wide instead of 5.
speaking of... i am now off to being the process of crocheting together a 180 panel afghan for a customer at the store. yes, i am being paid. yesterday i decided to minimize my productivity. i have been working so hard for so long that i really needed a day off. yes, i know it was a monday. what's it to you, huh? i did dig out my bedroom so i would no longer be swallowed by my "tech piles". and i knit. a lot. i finished the 5th block of my Lizard Ridge, and i am very close to completing the 6th block. when i finish the 6th, i will go back to my unfinished projects, which as you may note from the side bar, are piling up on me. (piles! imagine that.) the christening shawl is the only one that has a deadline, but i have had a good reason to not work on it in the last 2 weeks... i'm not crazy enough to knit lace dog tired. this block was knit in Noro Kureyon colorway number 182.
i have had very little time to knit or crochet with my hectic work schedule, but i recently spent several hours sitting at the MVA getting my title and plates changed on my car. i needed a project that i could easily keep track of in a noisy (potentially uncomfortable) room so i wouldn't go stir crazy. this one was completed almost exclusively under unusual circumstances. sitting and standing in line at the MVA was one half. i did about 1/4 of it in complete darkness, and most of the last bit was done in the car, stuck in traffic (i moved 5 miles in nearly 3 hours, perfectly safe knitting "speeds"). i bound it off at home. this is Noro Kureyon in colorway number 95. i loved it in the skein. i wish it had knit up with a little more variety. because i am doing 6 pattern repeats instead of five on my blocks, when i came to the end of my yarn all i had left was one color... so i cut it and finished off the last stripe with the remains of a prior ball. i made a little mistake in the pattern on this block, and i did not notice until after i blocked the piece. boo. maybe i will be the only one who notices...? last night we opened The Oresteia. finally! it was a huge show, and getting it up on its feet made me feel less than human for the last 2-3 weeks. i am happy with my work, but if i had another week there would be a little less "quick and dirty" hiding behind the lovely exterior of these garments. Joe Brack, Katy Carkuff, Jennifer Crooks, Misty Demory, Nick DePinto, Kevin Finkelstein, Gwen Grastorf, Theo Hadjimichael, Brian Hemmingsen, Keith Irby, Nanna Ingvarsson, Ashley Ivey, Elizabeth Jernigan, Hilary Kacser, Lisa Lias, Kenny Littlejohn, Beckett Martin, Meghan Nesmith, Anne Nottage, Kevin O'Reilly, Rachel Lee Poole, Julia Proctor, James Radack, Julie Roundtree, Joe Thornhill, Amy Quiggins, Jjana Valentiner, Ron Ward, Lindsay Kitt Wiebe. i will share pictures as soon as we get them back. i have been busting my backside to get The Oresteia on its feet. i have been cutting so much fabric that i have a knot in one of my hand muscles from scissors use. in other news, the Maryland MVA is not so bad. take your patience pills (as my mother would say) and you can get through the whole experience just fine. we will see how i feel about it once i go back in a week or two.